Clayton Kershaw‘s season debut on Jackie Robinson Day with the return of Yasiel Puig and four other former Dodgers in the Reds lineup meant there was plenty of potential for drama. Fortunately, there wasn’t as much as expected for most of the game, but three runs were scored in the final frame, including a walk-off two-run dong from Joc Pederson providing an amazing 4-3 win. The fireworks got started immediately, as Kershaw was greeted in the 1st with a two-run homer from none other than Puig. But Kershaw settled down immediately after that, facing just one batter over the minimum the rest of the way. He made it through seven innings on an efficient 84 pitches, surrendering just the two runs on five hits, striking out six and walking none. On the other side, the Dodgers got off to a quick start as well. A walk by Joc Pederson started the game, and then a one-out single by Justin Turner put runners on the corners. That set things up for current NL Triple Crown leader Cody Bellinger, who roped a down-and-in slider (!!!) for a double to cut the lead to 2-1. That put runners on second and third with one out, but also started a trend for the night, as the next two Dodgers struck out to kill off the threat. They also stranded a runner on second with two outs in the 2nd, and then runners on first and second with one out in the 3rd. The 5th started with a Joc single and with one out JT singled as well to put multiple runners on again. Alex Verdugo followed with a walk to load the bases, and AJ Pollock tied the game by drawing another walk to force a run in and make it 2-2. However, the Dodgers could not capitalize on anything further and the game remained tied. Perhaps even worse, Bellinger exited the game with a leg injury after being hit on the knee by a Luis Castillo pitch. Cody Bellinger hit near the right knee, trying to stay in the game. 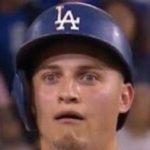 Bellinger replaced in right field by Alex Verdugo. Roberts said X-rays came back negative on Bellinger’s knee. After Pedro Baez pitched a 1-2-3 scoreless frame in the 8th after Kershaw exited, the Reds managed to push one across against Kenley Jansen. A lead-off double got him into immediate trouble, but he seemed on the verge of escaping thanks to a strikeout and a fly out. However, Matt Kemp rolled one to right against the shift for a single to give the Reds a 3-2 lead. Thankfully, the Dodgers finally cashed in runners of their own, as Raisel Iglesias started the 9th by walking David Freese. 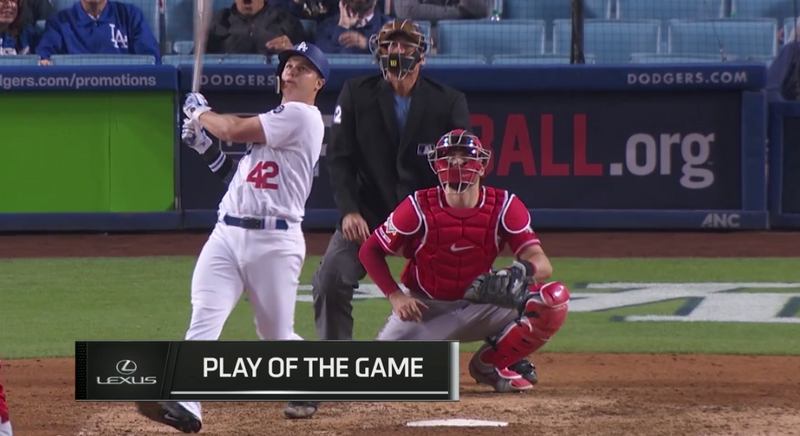 He then hung a breaking ball to Joc, who promptly pounded it over the wall in right for a two-run dong and a 4-3 walk-off win. He didn’t hit it as far as he thought, but it counts all the same. The Dodgers improve to 10-8 with the victory, and while it’s way too early to care about standings, they are just a game back of the Padres in the NL West now. Tomorrow the Boys In Blue will look for a series victory over the Reds at 4:10 PM HST/7:10 PM PST/10:10 PM EST, and they’ll send Kenta Maeda to the bump against Tyler Mahle.